The last year has seen significant changes in the way hotels can attract and convert guests through their direct website channel. Some of this change has been driven by updates from big players such as Google, while other aspects have been brought about by changes in user behaviour. Either way, the effect is the same: it is costing more to generate direct traffic and organic traffic is being increasingly replaced by paid traffic. If you’re not paying, you’re less and less in the game. While Google is still the undisputed leader of traffic generation, recent changes in their search results page layout have changed the balance between paid and non paid real estate on the page, which means a reliance on Google for website traffic has now become more expensive than ever. Increased number of ad extensions - these are the text additions below the main ad body which include everything from sitelinks to a list of facilities and unique selling points (USPs). The combined effect of all these changes is that less users are finding your hotel organically and more and more are using paid clicks to reach your site. A typical scenario would be that for a brand name search, where someone directly searches for your hotel name, your own pay-per-click (PPC) ad is now joined by up to 3 other ads from review sites and competing online travel agents (OTAs). This leads to your organic listing being pushed further down the page and an increase in the likelihood that a user will click on an ad rather than the organic result. This picture is even more dramatic on the smaller mobile screen, with users needing to scroll through up to 3 screens to reach the organic result, as shown in Figure 2. 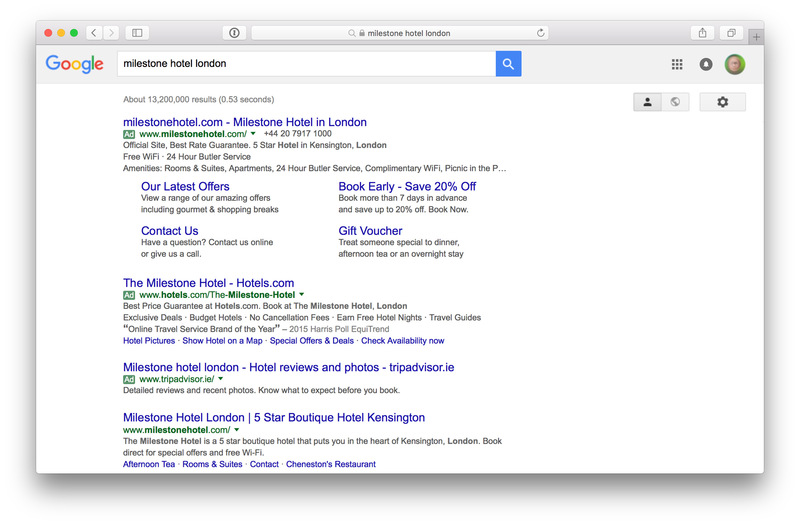 This situation is likely to become the norm and indications are that it could soon become even harder to reach the organic result, with the latest test from Google moving the company’s own hotel ads booking widget from its previous position in the right of the page to pole position at the top, above the PPC ads. This makes paid channels even more prominent at the expense of organic. While searching for a suitable hotel to book, users are bombarded by messages from every quarter, all promising the best deals and options. So it is no wonder that the customer journey is getting longer, with multiple touch-points along the way. Users choose to research on multiple platforms, using multiple devices, at various times of the day as they gather information and move towards decisions. This dramatically increases the potential cost to an advertiser of reaching their potential customer along this complex journey. In addition to this, many users are now on ‘closed networks’ that cannot be accessed by advertisers. Such closed networks include users using a downloaded OTA app for example, rather than a search on Google, or someone who bases their decisions on information gathered from social media networks. The move to mobile has accelerated this behaviour, making it even more urgent to develop a coherent strategy for improving direct business. The choice is clear - engage more strongly with these users through paid channels or risking passing them to competitors or third parties. However, just throwing money at the problem is not the solution. You need to make the most of the various paid channels by using all the tools at your disposal correctly and strategically. Given the changes highlighted above, it is more important than ever to maximise the conversion of existing users and this is where advertising networks come to our aid. As usual Google is at the forefront, with a variety of options to help leverage your existing data. Remarketing - presenting a recurring message to users who have previously visited your site - is achieved by creating an audience of visitors either through Google analytics or by adding remarketing code to your website. Once a user visits your site they are added to this audience and you can then present them with a tailored message while they browse other sites on the web to encourage them to return to your site and complete their booking. RLSA - remarketing lists for search are similar to remarketing but they work directly in Google search rather than on Google’s display network of websites. This allows you to customise bids for searchers on Google who have previously visited your website, while they are actively searching on Google, so you can decide to pay a premium to capture a click from a user who is already familiar with your brand but may be tempted to go elsewhere. Customer match - again this works by creating an audience, but instead of users who have visited your website, it allows you to harness the power of your email database by presenting a message to users who have an existing relationship with your hotel while they browse the web. Other options include remarketing through Facebook which works on the same principle as Google and allows you to target users who have visited your website, but this time while they are browsing on Facebook, or consider using cart abandonment tools (see Figure 3) to present a message to users when they leave your site. Meta search or free listings? 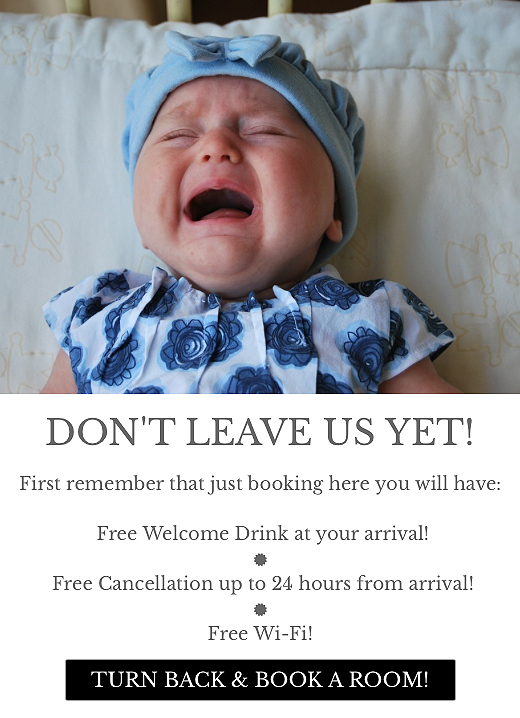 Most hotels are already present on the major meta search players such as Trivago, TripAdvisor, and Google Hotel ads, but these listings are effectively useless for generating direct bookings unless you are willing to pay. The major OTAs dominated this area until recently but more and more hotels are now consolidating their position online by bidding to appear in these searches. It makes sense that if a user is actively searching for your property, and your ad will appear only if you have availability for their chosen dates, that you should try and wrestle that user away from third parties and towards your own site. With the increased costs involved in customer acquisition, we need to use budgets in a clever way to maximise returns at the lowest costs. The old mindset of spending X to generate Y is obsolete and needs to be updated to reflect the current reality. Instead of looking at individual budgets on each platform we need a more holistic approach, with the use of a bundled budget. This requires a leap of faith and assumes a competent digital marketing provider, but the objective is to maximise revenue across all platforms rather than focussing on them individually. The basic premise is to analyse performance across multiple platforms regularly and to shift budgets according to performance to achieve an agreed overall target. So for example if PPC on Google is not performing well, but hotel ads are, then budget should be moved away from PPC towards hotel ads, until such a time as performance changes and budgets need to be adjusted again. It’s a continually iterative process. The landscape has changed but with a little effort and some additional costs, good results can and will be achieved. We recommend you consult with the experts on these fast-moving issues, and you will find the Bookassist Digital Marketing team always ready to give you up to the minute advice. Examine all the available platforms and see what will work best for your property. You don’t need to appear at every possible touch-point, but you should decide which ones are key and invest in them. Forget about return on investment per platform and look at the overall growth in traffic and business through your paid digital marketing initiatives. Keep on top of the latest trends and examine how users are responding to your message so that you can constantly update and refine it. Remember, although there is a definite push towards paid platforms, organic traffic is still an important part of the mix, so don’t neglect your SEO and social media engagement.